Do you want to make your educational or relevant business website more efficient? Then you must add quizzes on your web-pages. Quizzes will produce more traffic, generate more leads and keep the audience hooked on your website. Now, question is that how you will add quizzes on your site. Either you will do coding by yourself or ask the developer do it for you. But if you are doing all these things manually then it can take a lot of time as well as effort. We know that these elements are essential but with the amount of time and efforts it can take, is it going to be worth? Think again, because jQuery has come up with solutions that will make your site more attractive and sticky for viewers to fall for it. One of them is Quizzes. So, in this article, we’ve rounded up 4 best jQuery Quizzes Plugins through which you can add Quizzes to your website without any hassle. They are well documented and can easily get implement on your website without taking your much time. These plugins are something that will attract your visitors and slowly convert them into your recurring customers. jQuery plugins reduce the bounce rate of your website by keeping users on your website for a long time. It gives your visitors something to do that is fun loving activity, educational knowledge, and some relevant things. Quizzes are bound to get lots of social media shares, which puts your blogs and overall website on the map. It can capture the leads. According to research, the average quiz has a more than 32.5% lead capture rate. Moreover, these plugins often allow you to create a question bank, randomize the questions that are shown and randomize the answers that are displayed on your website. Below is a glimpse of how these quiz plugins will look on your website. Sliding Quiz is one of the most popular quiz plugins with which you can build or create multiple choice questions for many purposes such as teaching, blogging, advertisement etc. with ease. This plugin provides you a lot of option to make your quizzes more attractive by adding images/videos, option to add multiple quizzes on the same page, many configuration options and more. An option of AJAX submits score to the server which increases performance and speed of your site. Provides contact form to contact immediately with the support team in case of any query regarding the quiz test. 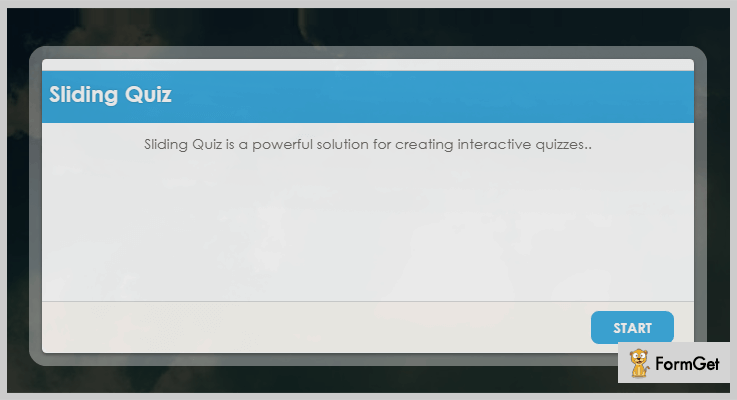 The plugin has a progress bar which shows the remaining time in a completion of the quiz. Sliding Quiz provides explanation for each questions present on a quiz. Option to show live scores on your screen. You can get all these features and functionalities for your website at $8 only with free updates & 24/7 customer support. Quizy-Fill in the blank tool is easy to set up on your website that enables the creation of fill in the blanks quiz in the browser. With this plugin, you can change the positions of quizzes and even number of how many quizzes you want to display on your site. The plugin is simple to use and provides various settings in order to enhance its usability. It provides HTML inbuilt code which helps you to show where the text and the answers should appear. The plugin has a callback function which will return an object with three parameters i.e., correct answers, all answers and time. It allows boolean parameter (true or false), which enables the dragging option on your touch devices. You can change the word size of your quizzes if you have shorter or longer words than normal. This plugin will cost you nothing. It is completely free so you can use its advantages for a lifetime. 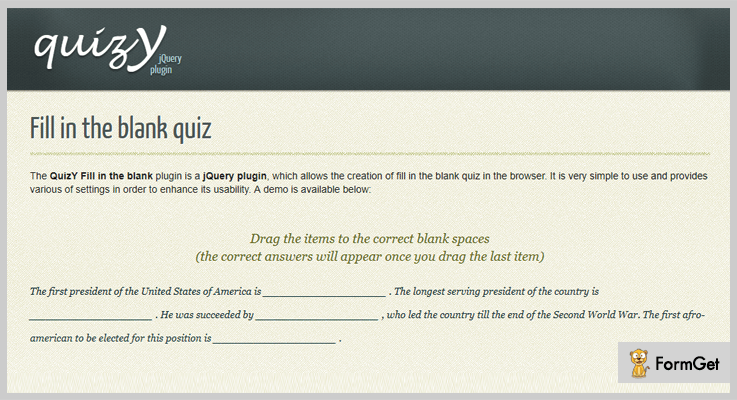 jQuery plugin for js quiz is a free tool which enables you to create multiple choice questions & answers. This plugin lets you build engaging quizzes that help your blog stand out from the crowd. You can highlight tests, personality quizzes provide different colors on every question and many more with it. You can display the quizzes questions in a different category. It gives you multiple options to change the color of your questions code. The plugin displays the live score of every correct answer. This plugin will cost you $0. Means you will get its all advanced features & functionalities at free of cost. 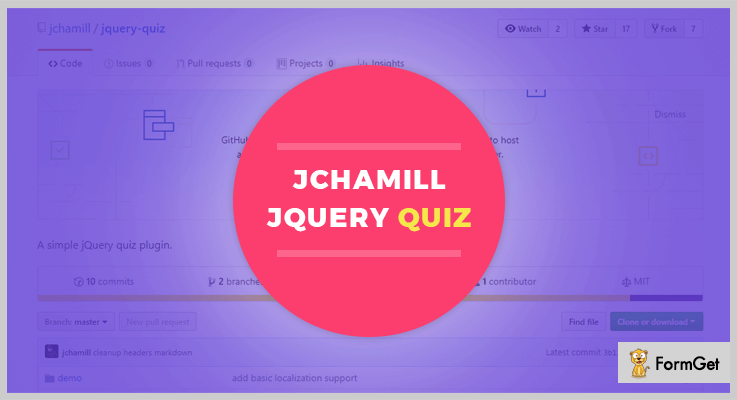 jQuery Quiz is a simple, yet effective plugin which helps you to port quizzes from an existing platform to the new one. It creates simple multiple choice quizzes. With the help of this plugin, you can customize the screens of your website and text that are displayed on a web page. It specifies the counter format which displays the exact location of question you are currently on. The plugin has an option to show gameOver on your screen if the quiz answers are wrong. It provides a various callback function when the user select answer or a select next button. The tool allows you to specify different options for each question. You can add as many questions as you like in your quizzes. You can get this tool at free of cost only from GitHub official website. These were the choices of 4 best jQuery Quiz Plugins we’ve selected for you as per the user’s satisfaction ratings and reviews. Every plugin in this blog comes with various functions and functionalities which makes your website an user engaging site. Hope these tools will definitely fit your requirement and needs. Moreover, if you have any other suggestions regarding more quiz plugins, then do let us know via the comment section below. Enjoy!